You also must know that bread pudding is simply not complete unless served with a decadent sauce. 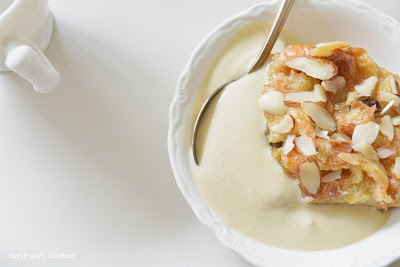 I made a maple creme anglaise to spoon over ours, and it was absolutely wonderful paired with the nutmeg and hint of orange liqueur in the pudding. Creme anglaise is basically a stove-top-cooked custard, but thinner and more pourable than most custards. 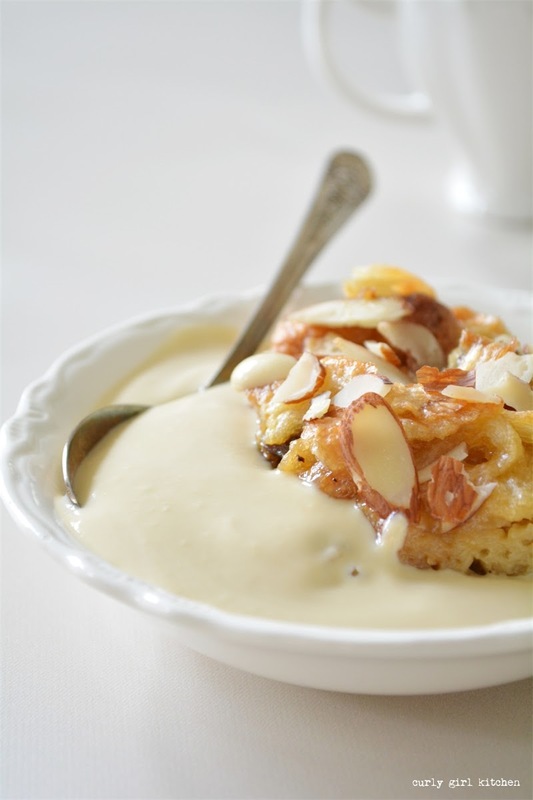 A handful of raisins in the pudding plump up nicely as it bakes, and a sprinkling of almonds on top adds a nice crunch to contrast with all the soft, creamy textures. This dessert is quick and easy to prepare at the last minute, is served warm, and looks so lovely spooned into pretty little bowls. Preheat the oven to 350 and grease an 8x8 baking dish with non-stick spray. In a bowl, whisk together the eggs, milk, cream, brown sugar, vanilla, nutmeg and orange liqueur until very smooth. Stir in the croissants and raisins, then spoon the mixture into the baking dish. Sprinkle with the almonds. Bake for 25 minutes until the top is golden and the custard set. Let cool slightly while you make the creme anglaise. In a saucepan, whisk together the milk, cream, egg yolks and maple syrup. Over medium heat, cook the sauce, while whisking constantly, until thick enough to coat the back of a spoon. Remove from the heat and add the vanilla. 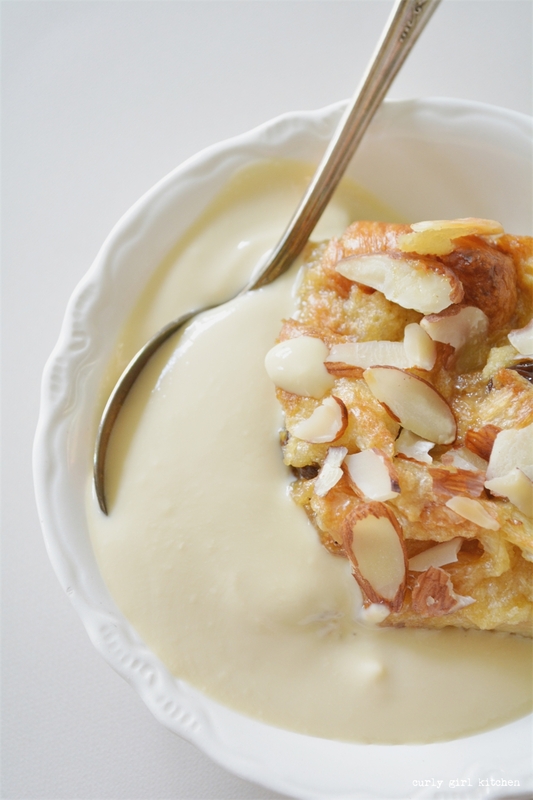 Serve the bread pudding warm, topped with the creme anglaise.